Is there a better approach to anti-doping? Cycling’s perennial bugbear – doping – has reared its head again recently, with highly visible EPO positives to the Iglinskiy brothers, the rather limp response from their Astana team, and the evident toothlessness of the MPCC group which claims to safeguard clean cycling. I know, doping never really went away, for all the talk about ‘different’ racing styles, biological passports and a new generation. I do think progress has been made on reducing dopage, but of course the trickle of positives reminds us that there is still plenty of work to be done. The trouble, of course, is that catching cheats is extremely difficult, even with the biological passport and targeted testing regimes. It’s not always black and white, either. Often, prosecuting a doping case comes down to interpreting the probability of an athlete’s biological profile being influenced by natural versus artificial factors. Proving guilt can be bloody difficult. The truth is that much of the fight against doping in cycling is based on automated algorithms and statistical modelling techniques that are designed to reveal physiological outliers. The software makes probabilistic bets, and if abnormalities of the right type are found, the data is examined by human experts who then make assessments of the probability that the data shows doping. Reasonably, because the cost of false positives is so high (in terms of rider reputation and career damage, legal costs and even the kind of mass sponsor and broadcaster exodus we saw in the post-Armstrong period) the probability of a genuine positive needs to be very high before action is taken. This leaves an uncomfortably large and murky grey area where unscrupulous riders are able to use the modern sophisticated doper’s bag of tricks (microdosing, masking agents, small transfusions, and other techniques) to dope, while flying under the statistical radar, so to speak. Think of a recent case like Team Sky’s erstwhile rider Jonathan Tiernan-Locke, recently banned for two years after UK Anti-Doping (UKAD) ruled that his irregular blood values could not be explained by binge drinking and dehydration. The ruling effectively made a decision that on the balance of probabilities, it was almost certain that Tiernan-Locke was not just ‘on the piss’, but taking it as well. He stuffed up badly and his blood values set off all the alarms. Two-year ban. Contrast his case with Roman Kreuziger’s ongoing argument with the UCI and WADA over whether his biological passport was criminally abnormal in 2011 and 2012, or just a bit idiosyncratic. It took more than two years (and probably a new algorithm) to reveal the alleged problems with his biological passport. The red flags weren’t raised. It’s ten years since my last read of an exercise physiology textbook so I’ll reserve my judgment, but Kreuziger (and his experts) have argued that the probability of doping is not conclusive enough to ban him. The Czech federation agreed on September 22, so for now he is free to race. I don’t know for certain if Kreuziger was doping or not, but I do know that his argument rests on exploiting doubt about the probability of a genuine positive. He is well and truly in the grey area. So, why am I writing about statistics? Well, there’s an interesting new approach to anti-doping, and it’s being led in Australia. It’s intended to complement existing anti-doping by rewarding athletes who are statistically very likely to be clean, by certifying them as being so. If WADA and bans are the anti-doping stick, then the Clean Protocol is the carrot. It shifts the emphasis away from proving doping, where certainty has to be near-absolute, to endorsing a rider for being clean. Because riders who don’t meet the protocol face no punishment, the threshold for repercussions can shift – the protocol doesn’t say that any rider is doping, it just says “we guarantee this rider is clean”. The bar for proving someone is clean can be placed in a very different area, statistically, than the bar for proving someone is dirty. It can be much tougher. For the majority of clean riders, the current status quo is frustrating because there is no way of separating them from riders who are in the grey area of ‘doping but getting away with it’. By signing up for the Clean Protocol (or similar, as long as the methodology is trustworthy) riders would have a way of proving (to a very high degree of certainty) to fans and sponsors that they are not doping. It creates an incentive to be fastidiously clean, because the commercial implications for sponsors, and teams hiring only certified riders, would potentially be huge. So, who’s behind this idea? Three people: Australian Teague Czislowki, Briton Andrew Johns (a lawyer and an ex-elite triathlete respectively) and American Dr Mike Puchowicz, a sports medicine doctor from Arizona, perhaps better known to cycling fans as the writer of the Veloclinic blog, where he analyses power data from climbs. Puchowicz has a great explanation of the reasoning behind the Clean Protocol on his blog. The basic protocol is that athletes must disclose who they work with; undergo psychometric testing; provide all the biological data gained in the course of normal WADA and other testing; provide information on injuries, supplements and therapeutic use exemptions; undergo a series of psychological deception tests of varying complexity; and encourage the people they work with to sign up for the protocol and undergo the same testing. It’s undeniably stringent. But it needs to be, if the aim is to certify to such a high degree of confidence that a person is clean. I think the idea has a lot of merit, provided the modelling techniques used are peer-reviewed and transparent. The scientific rigour must be unimpeachable. Athletes might argue that the demands of anti-doping are already unreasonably tough – principally the whereabouts requirements and early-morning knocks on the door from testers – but as we’ve seen, the punitive approach has been hitting the limits of its ability to weed out dopers for many years. The Clean Protocol doesn’t replace any of the current testing, it’s additional and complements it. Groups like the MPCC have failed to increase trust because their commitments have been shown up as hollow, there’s no rigour underpinning their statements about clean sport. A voluntary certification supported by robust science would be a very different proposition. The Clean Protocol is an idea to keep an eye on. 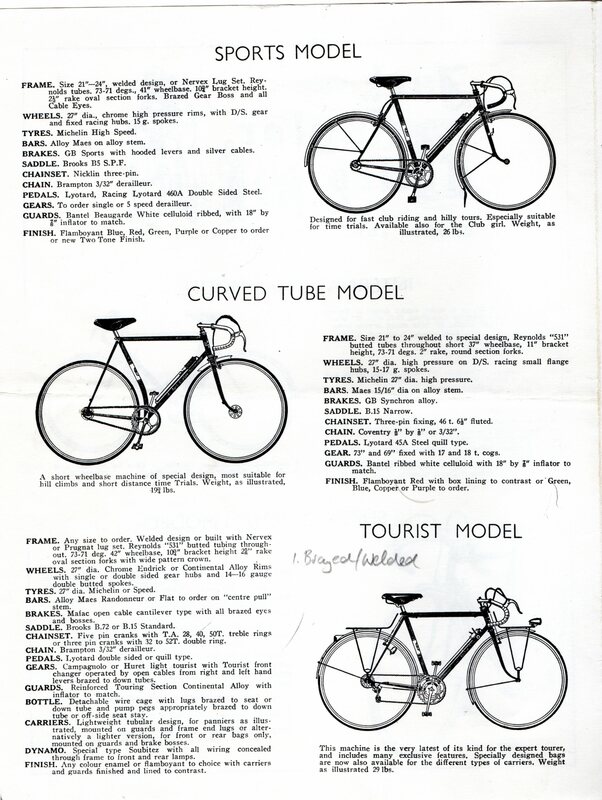 Another vintage bike catalogue from another famous English framebuilder. Jack Taylor produced his first frame in 1936, and the family continued to build frames until the 1990’s. 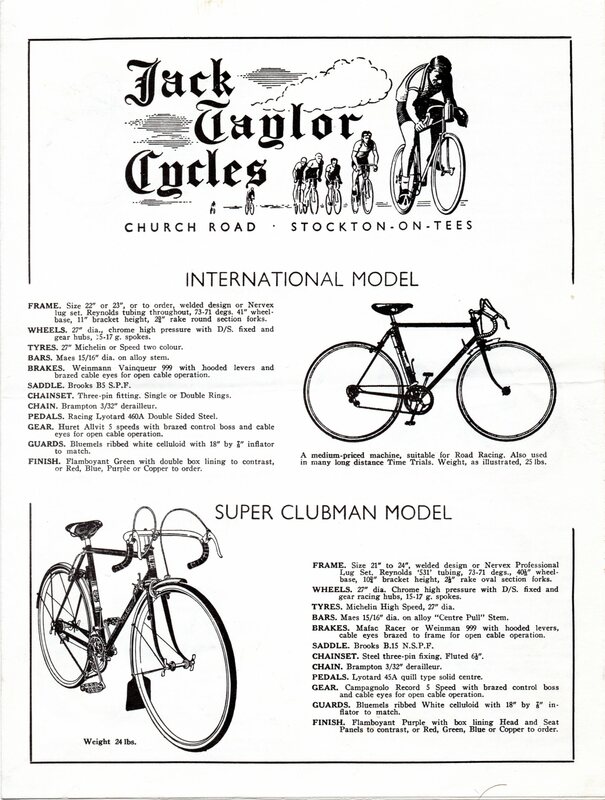 They were well regarded for their quality, enough for my dad to spend £430 in 1977 money (£2,700 in today’s quids, or $4,900 in Aussie dollars) on a Jack Taylor tourer with a custom built frame. 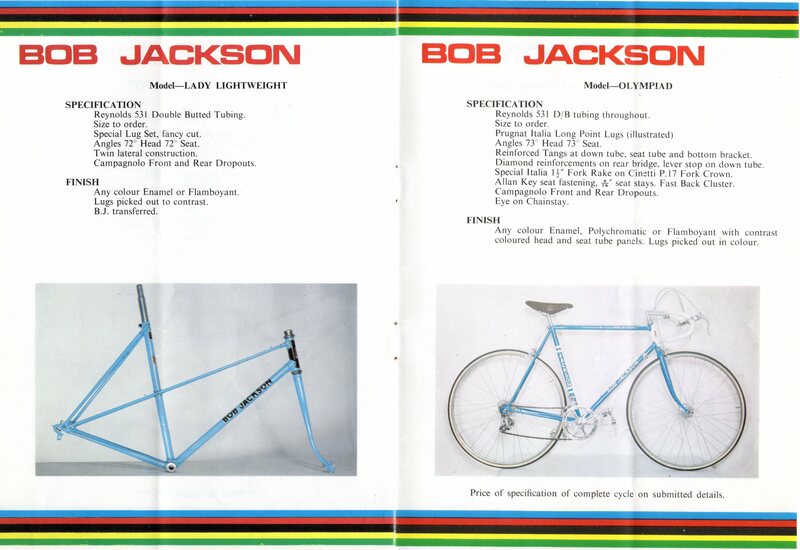 My dad was a pretty frugal sort of bloke, so for him to spend that much money on a bike he must’ve been pretty impressed. He never rode the Jack Taylor much, I think he preferred his Bob Jackson, or maybe he was just saving the Jack Taylor for best. It’s still sitting in my mum’s garage, waiting for me to restore it. 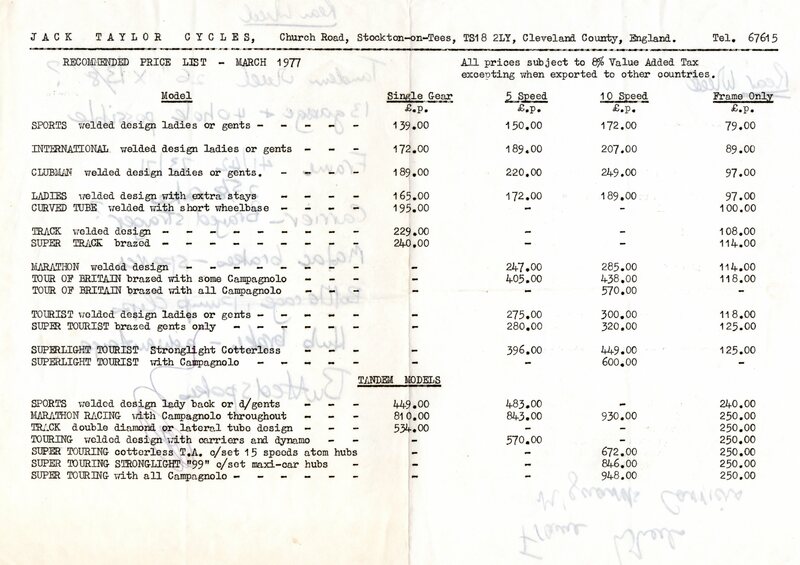 Anyway, here are the models and specifications, and price list from March 1977. There’s some good information about the company and the Taylor brothers here and here. 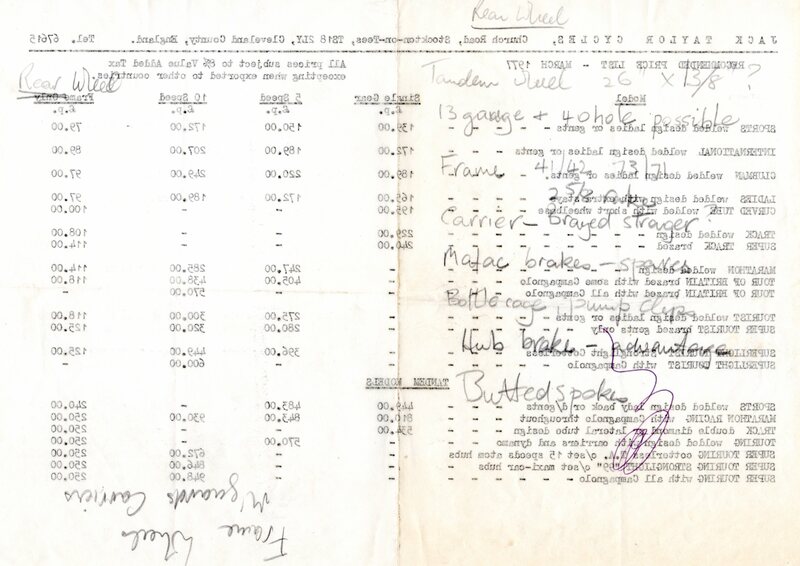 The receipt from my dad’s Jack Taylor purchase. The frame was custom built for him. Some hand-written notes from my dad. I found something special recently. Well, to be more correct, my mum found something special and gave it to me. 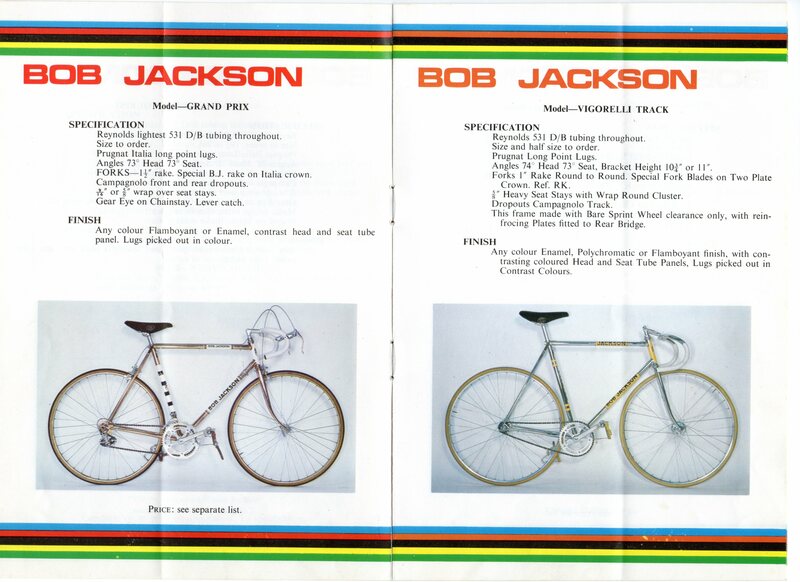 This is a catalogue from Bob Jackson Cycles in Leeds. 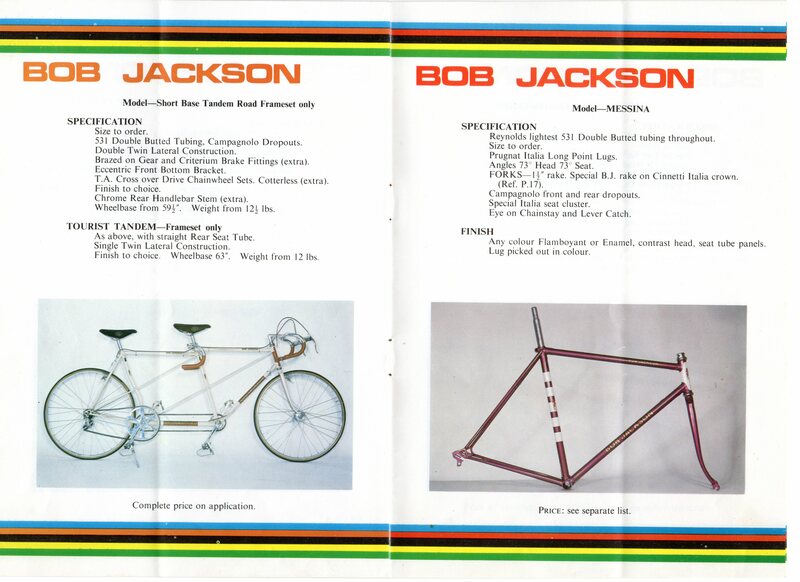 Bob Jackson is still a going concern, and several of the models in these pages are still available. They will also build custom frames. 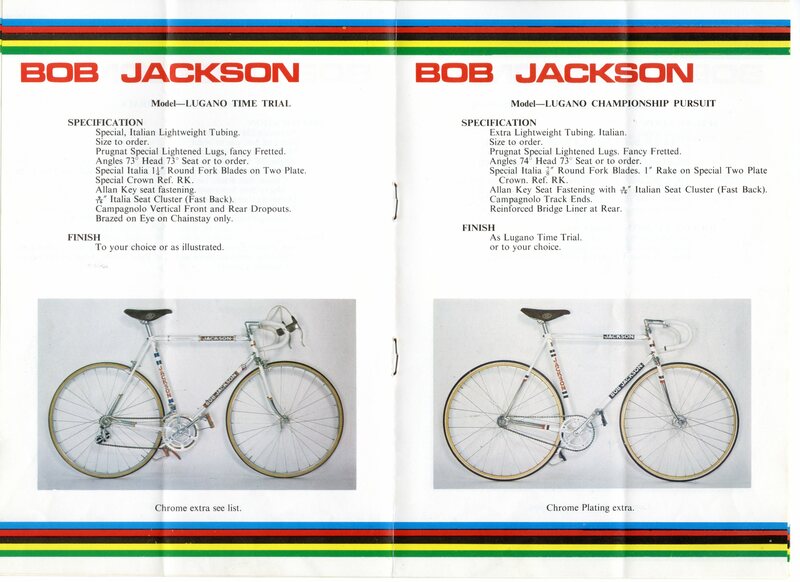 We have it because my dad bought a Bob Jackson tourer when he lived in Cambridge in 1976. 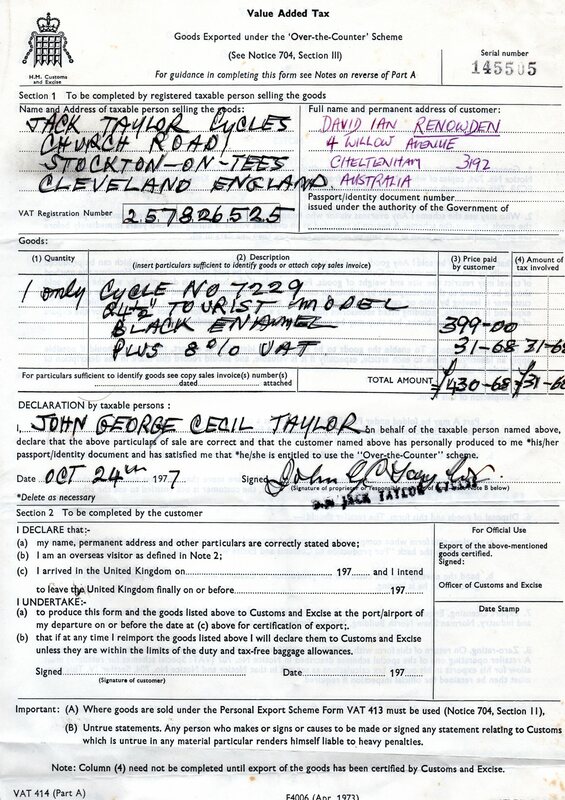 I have the receipt – he paid £199 from Ben Hayward & Son, ‘Cycle, Radio & Electrical Agents’ of Trumpington Street, Cambridge. That’s about £1460 in 2014 money. 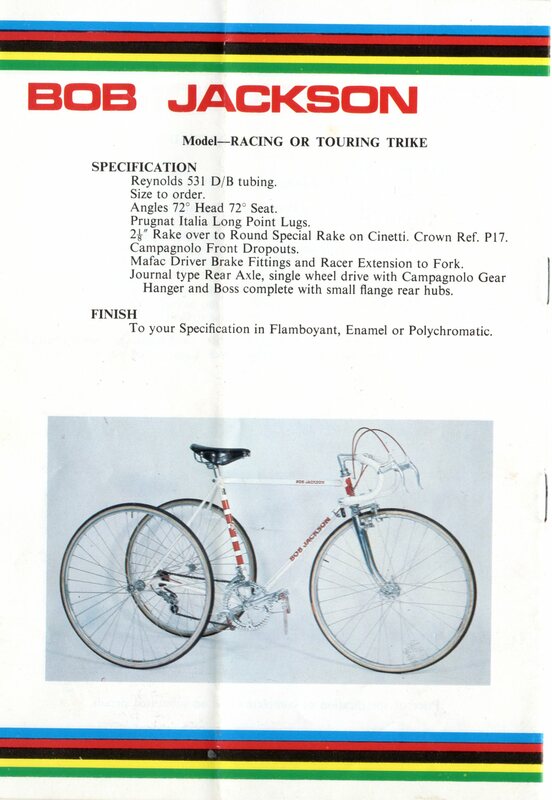 It was a magnificent bike, and he rode it thousands of kilometres around the UK, then brought it back to Australia. In fact, he was almost certainly riding it the day I was born. He was touring around northern Victoria with a group of school kids, because he was a teacher and used to take groups of students on multi-day touring trips. I was born a few weeks early, and this being many years before the invention of the mobile phone, it was several days before he was able to be tracked down. When I got a bit older, he took me along on some of these trips. It’s pretty unequivocal that that’s where my love of cycling came from. He rode that bike to work nearly every day. That was when nobody rode bikes. So Bob Jackson is a name that I’ve known my whole life. They’re beautiful frames, one of the most revered of English frame builders, and still sought after. My dad is no longer with us, but his Bob Jackson is still in the family. I’m just waiting to grow into it. I’m not sure of the date this was published. I found another catalogue dated 1993, but that is not in colour. I suspect dad was sniffing around for a possible N+1 opportunity, but it was vetoed by my school fees. This may be from around the same time, but I’m not enough of an expert on components from the 1970’s/80’s/90’s to be able to tell. 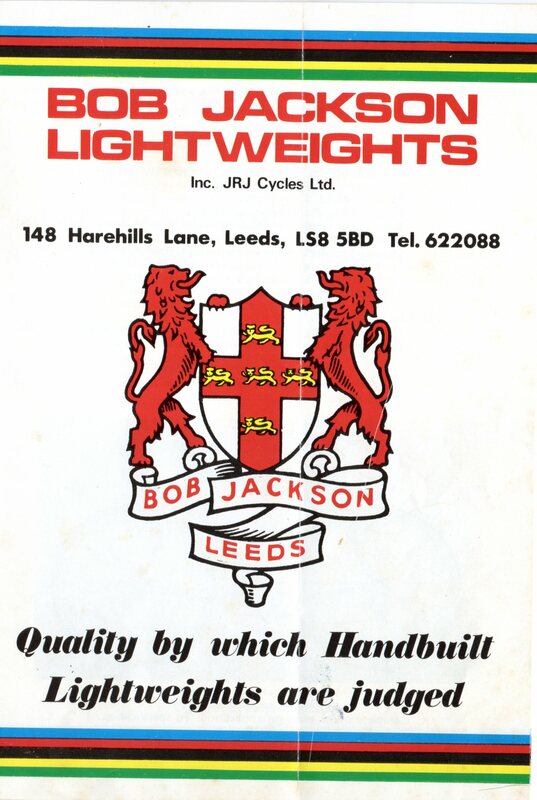 That famous crest still adorns the head tubes of Bob Jackson frames. The Vigorelli track frame is still available, starting at £450 (frame and fork). Time trial bikes have changed a bit. 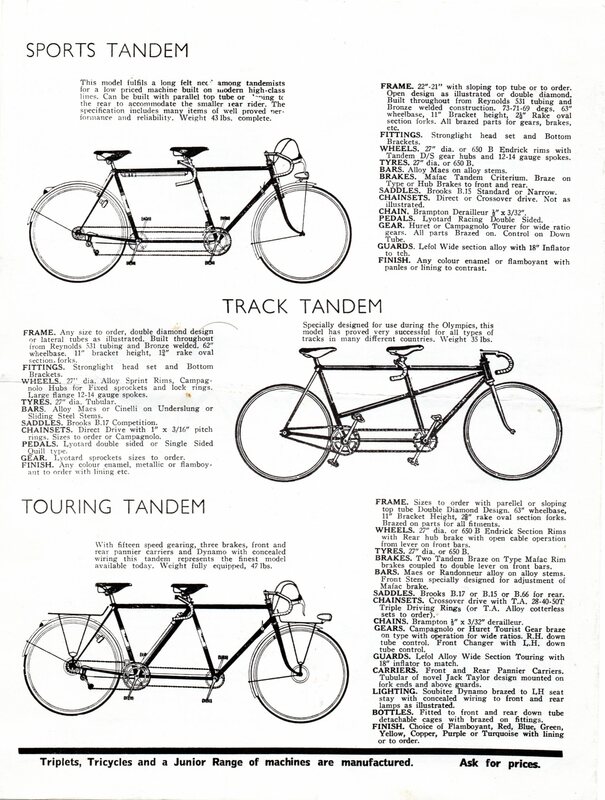 I love this tandem, and the Messina is a thing of real beauty. 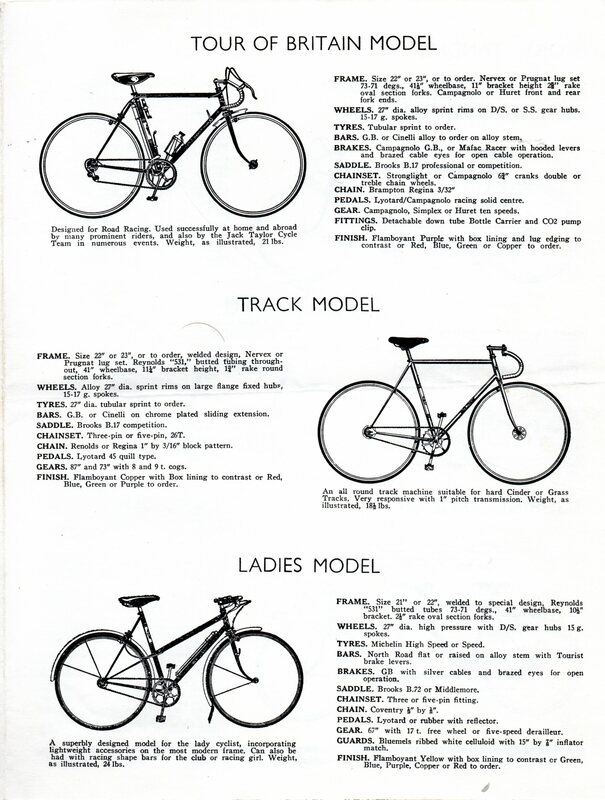 The ‘Lady Lightweight’ is a classical mixte. They even built a trike!